I am Irish (at least, from Irish descent) and have always celebrated St. Patrick's Day. Not necessarily out in the bars, but it is always a date that I try and mark somehow. 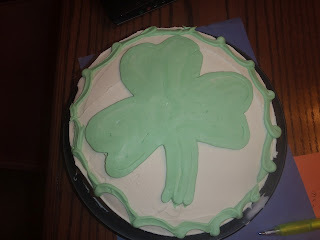 This year, I decided to surprise my guys with a shamrock cake. Being that I am not super talented when it comes to carving cakes, I decided to try a buttercream icing transfer. So, my first step was to dirty ice my cake. Then I placed it in the freezer; I traced my shamrock design onto wax paper, used a round tip to outline and fill in, then smoothed it out. I only left it in the freezer for about an hour. Towards the end of that hour, I covered my dirty iced cake with the rest of my buttercream. When that was done, I took out my shamrock, placed it onto the cake and peeled away the waxed paper. I was really happy with how it turned out given it was a first attempt from me. Next time I will make sure to smooth it out a little bit more. I hope the boys are as happy with it tomorrow night as I am! It looks great :) I love it. Is it green on the inside too? This one is really looking one of delicious and impressive featured cake. I am authentically crazy to see this one. The conception and information of this post really makes me crazy about it. It's truly mind blowing. Thanks for sharing.